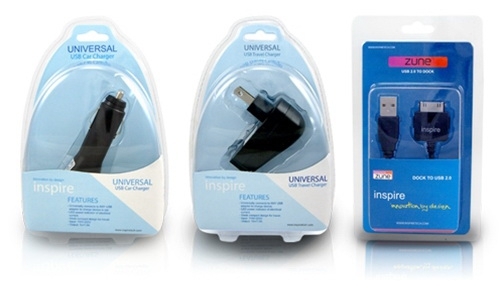 I've never heard of InspireTech, but they have some Zune products that you might be interested in; first, they have the 3 in 1 Charger Kit pictured above - but it's clearly three different products in three different boxes, so it doesn't fit my definition of "3 in 1". Regardless, the whole thing is only $15.99, so it's an affordable day to get your Zune charged at home or in your car. It doesn't look like the prongs in the wall charger fold down for easier transport though, so that's something to be aware of. Inspiretech has an assortment of Zune 4/8/16 accessories, and all those accessories will also work with the Zune 80, Zune 120, and the Zune 30. I'm pleased that Microsoft has kept the connector the same throughout all the models - it sure makes things easier!